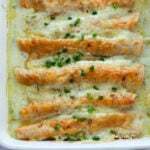 These Healthy White Chicken Enchiladas are one of our family's favorite main dishes. Easy to make and a total crowd-pleaser, they use yogurt instead of sour cream to make a creamy white sauce (with tangy green chilis). Everyone loves them! Cook chicken breasts. I like to poach them. Arrange in the bottom of a pot and cover with water. Add a sprinkle of salt (optional). Cover pot with lid and bring to a boil. Reduce heat and simmer for 10 minutes. Turn heat off and let sit for 15 minutes. Remove chicken. Test with a meat thermometer (should read at least 165 degrees F). Use two forks to shred chicken (debone if you're using bone-in). While chicken is cooking, prepare sauce. Melt butter in a pot over medium heat. Add flour and whisk until smooth. Cook, whisking for about 1 minute. Very slowly start to add broth to flour mixture, a few tablespoons at a time, whisking well between each addition. Mixture will seize up at first, but will gradually thin out as you add more broth. Continue until all broth is added. Cook, whisking occasionally, until sauce thickens slightly, probably around 5 minutes. Remove from heat and add yogurt and green chilis. Set aside to cool slightly. Shred cheese. Mix 1 cup of cheese with shredded chicken in a bowl. Divide it between the tortillas, roll them up and place, seam side down, in a lightly oiled pan. Pour sauce over pan of rolled up tortillas. Sprinkle with remaining cheese. Bake in preheated oven for 20 minutes, until heated through. Broil for a minute to brown the cheese, if you want.